I have not noticed poor SATA performance on the SB750. It is typically a few percent lower than the ICH10R in actual applications, but nothing that you ever notice on a day to day basis. As far as ACHI/NCQ problems, I have not experienced them with the SB710/750 yet. I don't see how it's a "trick", since the resolution is clearly stated. If you want to complain about it being "less monitor", I'd be far more upset about all the TN panels now being pushed into budget displays. I've used/tested several, and they're "fine" for most users, but they will never be the quality of an S-PVA, S-MVA, or S-IPS LCD. Can't fit a 32" TV on my desk nor sit ~3 feet away from it comfortably :p I wrote about the monitors as well. I will say that 1920x1080 is a win over 1680x1050 IF they are similar prices or a bit more and same panel types, at least you're getting more for the money. ex: a 1920x1080 TN for $50 more than a 1680x1050 TN. It's a ripoff when they substitute less vertical space in the same supposed screen size (the diagonal measurement allows them to cheat there) for the same price. Where this article fails is in not even mentioning panel types nor aspect ratios, and using a freaking TN in a $1600 system. Thank you for this wonderful guide. It's been a while since I planned to build a Phenom system, and it looks like I can finally finish it thanks to this guide. I do have a couple of questions. 2. 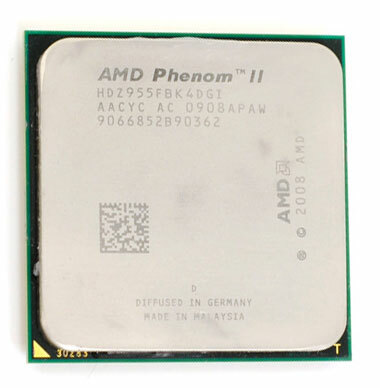 What is the system requirement of AOD (AMD OverDrive)? Does it work only on a board with SB750 or..? "This is release V3.0.1 of AMD OverDrive™ Utility. This version of AMD OverDrive™ Utility supports systems with the AMD RD890/RD790/RS780/RX780/RS780D/RS880 serials boards. AMD OverDrive™ Utility in general is designed to provide users the ability to maximize the capability, flexibility, and adjustability of the AMD chipset products; it allows user to tune parameters to help system stability, optimize performance, and control cooling/acoustic characteristics. AMD’s target is to provide an all-in-one utility which can deliver all-around stellar operation. Question 1 - The Core i7 memory controller is on the CPU, and it and the motherboard design is the controlling factor for triple-channel, dual-channel, and single-channel memory. The DDR3 memory itself is essentially the same whether used as single, dual, or triple-channel memory. Things are best when matched modules are used for memory. Since the Phenom II AM3 supports Dual-channel DDR3 and not triple-channel you are better off buying dual-channel DDR3 kits mainly because if you install 3 dimms your system will run in single channel mode, and if in dual channel you have an extra dimm. However, we have used triple channel dimm kits for Core i7 in AM3 dual-channel setups with no problems. One builder I know buys only triple-channel for the best value and then uses 2 or 3 or 4 or 6 DDR3 dimms - whatever is needed and works on the system - in his builds. The other way around is more an issue though, as the Core i7 memory controller can be very picky about the DDR3 you feed it. We know plenty of dual-channel dimms - mostly pre i7 - that work fine on other DDR3 boards, but that do not always play well with Core i7.